Everyone needs their coping mechanism for bad days. Some people browse the internet for cat videos. Others indulge in a donut and coffee when they feel a bad mood going on. While other people might squeeze a stress ball while taking deep calming breaths. All of these would have been better ways for Michael Myers to deal with his anger problem. Instead, he went down a path that we certainly would not recommend. Now, we're not sure what kind of calming techniques Smith's Grove Sanitarium tried to teach the disturbed young Meyers. It's tough to teach yoga and breathing techniques when your patient refuses to move unless motivated to kill. But still, if they had succeeded in getting little Michael to do child's pose and downward dog, perhaps he could have led a chill life in the institution instead of flourishing in a career of murder and mayhem. This jumpsuit is just like the one Michael swiped from his truck driver victim while making his escape. You'll have functional hip pockets and chest pockets to keep your belongings on your person at all times. And the whole ensemble is topped off with the instantly recognizable mask. The pale mask is scarred with one-hundred percent alpaca hair, as Michael Myer's masks go, that's pretty classy. So maybe you can give Michael Meyers a new start. Sure, you'll look as scary as the villain does in Halloween but that doesn't mean you have to act like him. Get out your yoga mat, splay yourself into corpse pose, and relax. Instead of going for the standard butcher knife, sit down with your sister and talk out your issues. 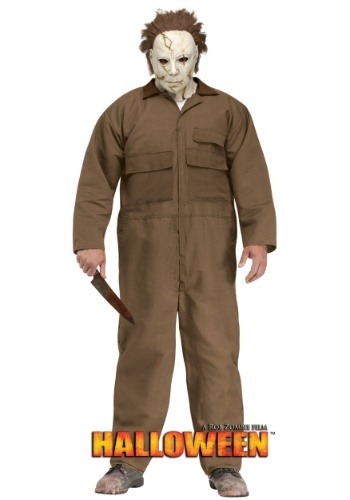 After all this time, we think poor ol' Michael Meyers deserves a second chance!